This month kickstarted by receiving a Proclamation from Mayor Bob Gatt – Novi.Yay!!! 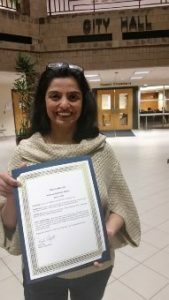 It was such an honor and privilege to receive the Proclamation on behalf of Michigan Academy of Nutrition and Dietetics. So what is a Proclamation? – a public or official announcement, especially one dealing with a matter of great importance. Mayor Gatt of Novi, Michigan announced March 2016 as National Nutrition Month and March 9th as Registered Dietitian Day. He encouraged all citizens to join the campaign and become concerned about their nutrition and the nutrition of others in the hope of achieving optimum health for both today and tomorrow. How about trying a new herb, spice, fruit, or vegetable that you have never tried before to celebrate your National Nutrition Month? Have you tried sprouted mung beans? Let me introduce you to this humble bean. 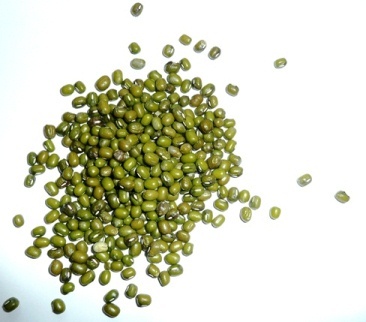 Mung beans (green gram seeds) are commonly used in Southeast Asian cooking- India, Thailand, China, Burma, Japan and Korea. It is an excellent source of protein and is almost free from flatulence-causing factors. Because of this, mung beans are preferred for feeding babies and those convalescing. The seeds contain a higher proportion of lysine than any other legume seeds. The seeds are processed and consumed as cooked whole beans or splits (dals), sprouts, immature seeds, and flour and are used in various recipes. You could sprout them and use it in salads and stir fry or cook them as a vegetable adding mustard seeds, tomatoes, turmeric and other spices with a dash of lemon. You can serve it with rice, chappati or any millet tortilla. Mung bean vegetable soup can be consumed as a meal by itself.